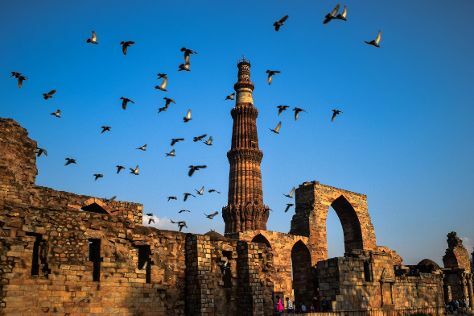 New Delhi is known for historic sites, parks, shopping, museums, and fun & games. Your plan includes some of its best attractions: take in nature's colorful creations at Humayun's Tomb, contemplate in the serene atmosphere at Birla Mandir Temple (Lakshmi Narayan), don't miss a visit to Hazrat Nizamuddin Darga, and indulge in some culinary diversions at a local gastronomic tour. For photos, reviews, maps, and other tourist information, go to the New Delhi travel route app . Use the Route module to find suitable travel options from your home destination to New Delhi. In March, daytime highs in New Delhi are 34°C, while nighttime lows are 18°C. Finish your sightseeing early on the 9th (Sat) to allow enough time to drive to Agra. On the 10th (Sun), step into the grandiose world of Agra Fort, then make a trip to Jahangir Mahal, and then take in the local highlights with Walking tours. Get ready for a full day of sightseeing on the next day: admire the landmark architecture of Taj Mahal, then make a trip to Tomb of Itimad-ud-Daulah, and then admire the striking features of Diwan-i-Am Agra Fort. To find other places to visit, traveler tips, photos, and more tourist information, go to the Agra trip itinerary maker site . Traveling by car from New Delhi to Agra takes 3 hours. Alternatively, you can take a train; or take a bus. In March, daily temperatures in Agra can reach 36°C, while at night they dip to 17°C. Wrap up your sightseeing on the 11th (Mon) early enough to travel to Varanasi. Kick off your visit on the 12th (Tue): get the lay of the land with Walking tours, contemplate the waterfront views at Ganges River, and then don't miss a visit to Dasaswamedh Ghat. For reviews, photos, where to stay, and tourist information, go to the Varanasi trip planner . Fly from Agra to Varanasi in 2.5 hours. Alternatively, you can drive; or take a train. March in Varanasi sees daily highs of 38°C and lows of 20°C at night. Cap off your sightseeing on the 12th (Tue) early enough to travel to Amritsar. On the 13th (Wed), get the lay of the land with Walking tours, take in nature's colorful creations at Jallianwala Bagh, and then take in the spiritual surroundings of Golden Temple - Sri Harmandir Sahib. To find ratings, where to stay, photos, and more tourist information, use the Amritsar travel planning site . Traveling by flight from Varanasi to Amritsar takes 5 hours. Alternatively, you can drive; or take a train. Prepare for little chillier weather when traveling from Varanasi in March: high temperatures in Amritsar hover around 30°C and lows are around 13°C. Finish your sightseeing early on the 13th (Wed) to allow enough time to travel back home.